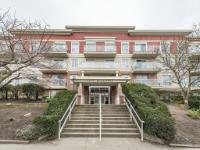 $499,900 R	2 Bed	2 Bath	796 Sqft NAI COMMERCIAL (VICTORIA) INC.
$368,000 R	2 Bed	1 Bath	932 Sqft NAI COMMERCIAL (VICTORIA) INC. The blue circle drawn on the map represents the area which is most likely to contain listings comparable to 406-951 Topaz Ave. If you wish, you may adjust the circle by dragging the white center handle to move it, or dragging one of its other white handles to resize it. Press the 'Next' button at the top when finished.